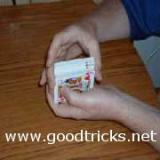 Card sleights are very useful moves used to assist a magician to perform a card trick. The noun sleight refers to cunning or cleverness so together with a little misdirection these moves can help a trick achieve a very powerful effect. Some sleights require greater hand dexterity than other but this page shows the workings of a few popular easy ones that when combined with a little practice will help you to achieve some spectacular magic effects. This is one of the most useful moves that the aspiring card magician can learn. 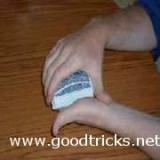 Start by holding the deck in the left hand as shown in (photo:1). The fingers of the right hand, should be holding the top edge of the deck lightly and the thumb of the right hand, should be resting at the bottom left corner. 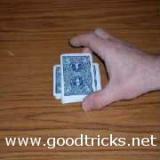 Try tilting the deck so that when you look down that your are able to see the cards under the thumb. If the right thumb and fingers squeeze the two cards lightly, maintaining a slight bend, the two will stick together as if they were only one card. There are many ways of performing a double lift and it is one of the most handy and commonly used card sleights. Practice this gem of a move until you get it perfect. You will reap the rewards many times over during your magic career. 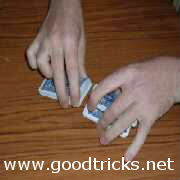 Make sure that before performing this trick, that the card to be palmed is at the top of the pack. The deck should be held as demonstrated in Photo:1 shown below. As long as the palm of the hand is not in view , this sleight will look completely natural and unsuspicious as it is not in an obvious gripping position or clenched fist. 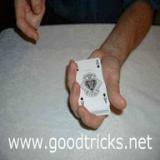 Riffle Force : This is an easy to do method of forcing a card and the basis of many easy card magic tricks. 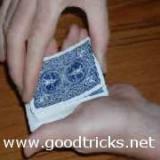 You can learn this sleight of hand quickly and it looks very believable to your audience. 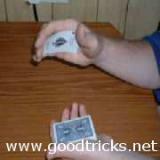 The secret is explained in this magic video tutorial. Use a little entertaining chat or make a funny comment to momentarily distract the spectator from the set up of the cards. Now ask them to pick up the top half of the deck of cards, tell them to look at the bottom one of that pile and and memorize this as their chosen card.. They can then put the two half packs back together and shuffle the cards. The card they have just memorized is the one that you took a peek at before on the bottom of the pack while shuffling. They should have convinced themselves that they have had a free choice in cutting the cards at this point while the real truth is that the card has been "forced " upon them. The pack is held in the dealing position. It's a good idea to slightly bevel the pack towards the outer fingers. This creates a slight edge and makes it easier for the pinky to feel and count down through the cards, the pinky tip is pressed slightly into the pack which creates a small break in the cards above and below the pinky tip. The opposite end of the pack (nearest to spectator) should be held slightly higher than the end nearest you to conceal the break. Also at the end of the pack nearest the spectator, the edge of the top card should be firmly pressed onto the next card down with your thumb to camouflage the break. 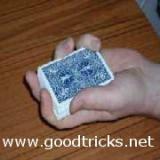 If the selected card is to be presented to audience, flip over the cards above the pinky break as shown in figure 3, using the thumb to help the move. The selected card should then fall face up on top of the deck. 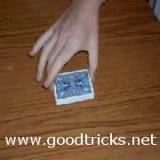 Maintain the pinky break and repeat the flip to return the cards to their original position. If the bottom cards are to be kept in position then they are allowed to fall from the left hand in the first movement of the shuffle. The deck is split into two packets, the ends put together, the cards being bent upwards and released in such a way that they become interlaced. To keep a card or a small number of cards on the top of the pack, you have simply to release it or them from the right hand portion of cards, last of all. 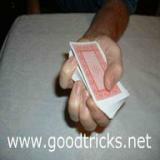 A card is presented in the magician's hand and vanishes right in front of your eyes. Even more amazing, is that the card appears again as quickly as it disappeared. 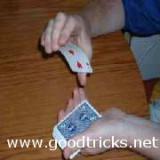 This move requires a lot of practice but can be incorporated into many card tricks and your practice in perfecting the move will be well rewarded with smoother showmanship. The video below shows the performance and the secret. This video shows a convincing card change with the use of a simple slide trick. 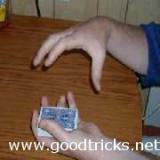 You can learn about card sleights by viewing some good quality learning card tricks DVD's which are a good way to learn card sleights by watching close up videos of professional hands performing popular sleights, accompanied by a clear explanation which are available from most good magic shops. Being able to spin a card in your hands looks really impressive. 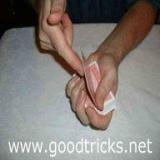 This link will take you to our magic tutorial page to learn the basics of this amazing stunt. This link demonstrates How to control a card to the top of the deck which is a useful sleight to know as it can be used in many cool routines. Or why not use the spread cull to control a card to the bottom of the deck. A good book for learning card magic is The Royal Road to Card Magic which is a card magic classic and a valuable learning aid.